Rather surprisingly, cacti rely almost exclusively on spines as a defense, very few use poisons. This is in contrast to many other stem-succulents that are extremely toxic; euphorbias, for example, contain long tube-like laticifers that contain a white, milky sap so poisonous that just handling the plants in a greenhouse requires caution. Many cacti have alkaloids that make them bitter but not toxic, several are described below. Lophophora williamsii (peyote) has alkaloids that are strong enough to make the plant extremely bitter (or so I have heard), and usually people cannot keep very much down for very long. Plants in nature certainly seem to be in pristine condition, with little sign of being eaten by insects or larger animals (other than humans). The plants do not seem to have any special glands or other secretory structures, so it may be that some or all the shoot parenchyma cells synthesize a small amount and each cell stores its own supply within its central vacuole. The species is being studied by Martin Terry at Texas State University at Sul Ross, and details will be posted as they become available. The genus Mammillaria is divided into several groups based on the presence and nature of a white milky sap. The “watery” mammillarias have none, the “milky” mammillarias bleed a thick white sap when cut, and the “semi-milky” mammillarias sometimes produce a cloudy sap when cut, sometimes produce nothing at all. The sap has been called latex, as is any milky, white liquid that oozes from plants, although technically the term “latex” should be reserved only for chemically defined secretions that contain rubber. 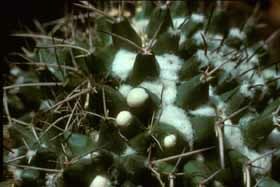 The latex in Mammillaria is produced in a network of long tubular canals that run throughout the shoots and which are especially abundant near the surface, even penetrating through the palisade cortex to the vicinity of the hypodermis. Canals are formed by a process in which a long set of cells first fill themselves with latex then break down. To a limited extent, cells next to the canal lumen are in turn stimulated to differentiate into latex-bearing cells which break down, thus causing the canal to become wider. This process is brief and the canals never become very wide, but as the plants grow taller, the canals recruit new young cells to convert to laticifer cells and thus extend the tube into the newly formed tissues. Mammillaria latex has never been analyzed chemically, but George Wittler discovered that in some species the latex is synthesized in the plastids, in others it is predominately composed of altered wall material, something that is very unusual. Tubercles of Mammillaria magnimamma, cut and oozing a milky secretion. Plants usually stop oozing after a few minutes, and the material hardens into a translucent cap that seals the wound, but occasionally the plants "bleed" for many minutes.